It's almost enough to make you want to reach for a drink! Lovers of real ale and cider are being invited to the historic Staffordshire city of Lichfield for the chance to sample some tasty tipples over the course of two days. The Lichfield Autumn Beer Festival is to take place in the city's popular Guildhall building over the course of Friday 20th October and Saturday 21st October. Beer and cider drinkers are able to go along to the Autumn Beer Festival from 12 noon each day. The popular beer festival is designed to help get rid of those post-summer holiday blues as well as get people in the mood for the winter months ahead. As well as an excellent and varied selection of real ales and ciders for people to enjoy, all of which are being provided from local and regional breweries, the autumn beer festival will also include great music on each of the two evenings, plus popular pork pies and a choice of refreshments. 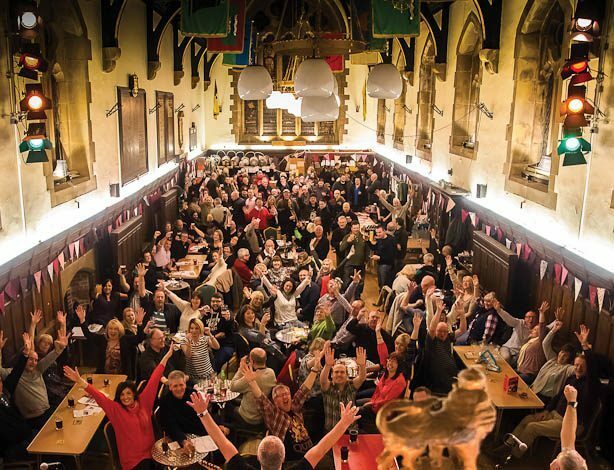 The historic Guildhall will again be the venue for the event, with the distinctive building having been rated by many real ale lovers as the best venue on the beer festival scene. The Grade II listed building has been instrumental in the government of Lichfield for more than 600 years, with visitors able to view the original prison cells in the basement. Friday 20th: Back In Time, featuring hits from Elvis Presley, Chuck Berry, The Rolling Stones and many more. Saturday 21st: Downshift, described as a semi-acoustic band performing classic and modern rock, pop and rock 'n' roll. Groups of people planning to visit the beer festival on either evening are advised to book early in advance to avoid possible disappointment. Further information relating to the ales and ciders on offer will be posted online closer to the actual dates of the festival. Entry before 6pm on each day will cost £2, with the admission price increasing to £3 after 6pm. For further information about the beer festival, please visit: lichfieldarts.org.uk/event/autumn-beer-festival-2, call 01543 262223, or email info@lichfieldarts.org.uk. The event has been organised by Lichfield Arts, which is based in Bore Street, Lichfield.